I want a carbon fiber vinyl center console in black with yellow stitching. Can you PM me to let me know how can we make that happen. I live in Canada. 07 Exige S300+,Solar Yellow,Touring Pack, Torque300 tune,RLS Intercooler,Pro Alloy IC tubes,Lotus Stage3 Exhaust,Intake BOE ITG cold airbox,RLS MKII 3.0 Pulley,SaikouMichi Oil catch can,NGK BKR7-EIX Plugs,EV14 525cc injectors,CarbonFiber side scoops+front lip+rear spoiler, Nitron SS Shocks, PC680 Battery,JVC KDNX5000,CompactSub Kenwood KSC-SW1,Tinted windows, Lotus Sport windshield+front plate decals,HID Kit 6000K,Parking Light,license Leds. Finally got the custom gaiters for the shifter and handbrake. Added a ipod mount/power point on the front of the console, brushed aluminum turn signal levers, painted the ac & console, it now looks more finished in there. Last edited by cornbeef; 08-11-2008 at 07:32 PM. Did you order them from the Lotus Trim Shop? If so, how long did the delivery take from start to finish? the gaiters were from lotus garage (who ordered them from the trim shop). took about 5 weeks from the order to delivery. the stalks are from eliseparts. Figured I'd add this photo in here. I was searching for orange trim pieces before on the forum and couldn't find anything. This will serve as a reference for people in the future. 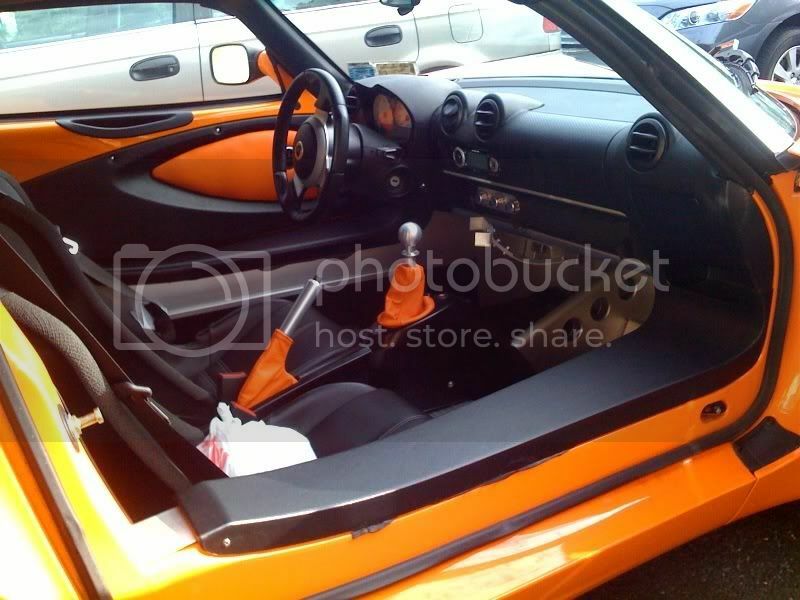 It's orange Lotus Trim pieces I got from a forum member here. It includes teardrop door panels, shift boot and ebrake boot. I also painted my center console black to blend better. Please do excuse the iPhone picture. 2005 CO Elise. Sports. Touring. Limited Slip. T/C. Hardtop. Star Shield. 2.11 Probax style with alcantara at the center instead of leather. Iceman... VERY nice! I want to do the same thing except in red. How long did it take from start to finish for them to complete the order? And do you mind me asking the price?? Paid stock price for Probax, approx 1300 pounds + Vat all. It takes 6 weeks from the order to your home. If you get stock non probax seats you must buy also all seat's runners, bolts and studs to fix well. Looks great. Isn't it cool to have what is probably the only car on earth with that interior? Anyone know how much it will cost with a S260 seat? The factory trim shop can do some pretty cool stuff. Has anyone seen or purchased any of these trim pieces in laser blue? I'm just wondering how well the color matches. I haven't been able to find any laser blue trim pictures. Since I live in the Midwest, there really isn't much of an option for me to go anywhere to pick up this stuff - does the Lotus Trimshop deliver directly to your door? I've been thinking about keeping my seats and just having them rewrapped in the design I'd like - would that cost more than ordering a new set from the Trim shop and selling my set? From what I understand the Lotus Trim shop does not deliver directly to your door, however, you could order through a place like Lotus Garage and they would then ship it to you. From what I've read rewrapping would be less expensive, but you'd have to find a place you trust, and hope for a close color match. I want to see it in laser blue too. No elise yet, but working towards it. I'm in the Chicago area and bought my Elise at FVMC. Any recommendations? I'd like to get my order going asap. Any dealership should be able to take care of this. Lotus of Durham helped me and had no problems getting what I wanted. I've only heard great things about the people at FVMC and I would not hesitate in contacting them about getting the pieces you were interested in. Here are pictures of my new seats i ordered from FVMC.